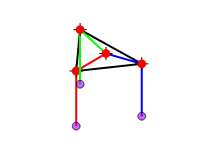 The Fermat Toricelli Point of a triangle is the point which minimizes the sum of the distances to the vertices of the triangle. This app represents a mechanical device for computing the point. Balls dangling from strings which pass through the vertices of the triangle naturally settle at the point of lowest potential energy. Can you see why this solves the Fermat Toricelli Problem?